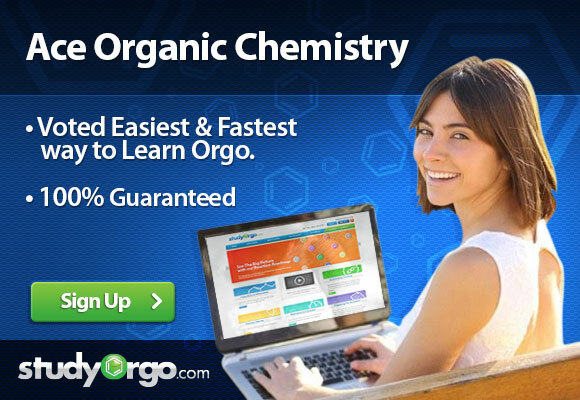 Here at StudyOrgo.com, we have devoted a lot of effort to explain the mechanisms of organic chemistry reactions. A popular second semester topic is electrophilic aromatic substitution (EAS). Remember that the aromatic ring is made up of 6 pi-orbitals in a ring that is planar, which confers to it Huckel aromaticity. This configuration is remarkably stable but under certain conditions, aromatic rings can undergo substitution reactions. It becomes more complicated when the mechanism uses a benzene ring that already has substituents at one group. For these situations, special rules are defined for 1) the orientation of the new group and 2) the rate of further addition on the ring. First, let’s consider the rules of Directing Effects (i.e. where the electrophile will add on the ring). Two possibilities exist; 1) ortho/para position or 2) meta position. This will be determined by the identity of the substituent at position R (Figure 1). Below in Figure 2 you will see a list of functional groups that will direct the electrophile to either of the possibilities. In general: the more electron-rich the atom that is attached to the ring, the more ortho/para directing potential. As for why this occurs, let’s consider resonance structures of the intermediates. Take a benzene ring with a methoxy group attached (Figure 3, left). If the electrophile attacks meta, there are 3 possible structures. If the electrophile attacks para (ortho is exactly the same), there are 4 possible structures. More important, the structure in green for ortho/para is most stable to complete the substitution mechanism. This is because the oxygen group can donate electrons to the resonance. In the meta position, oxygen cannot donate and it is therefore less favored. Now take a benzene ring with a nitro group attached (Figure 3, right). Only 3 resonance structures are possible for either ortho/para or meta substitution. But, the resonance structure in red for ortho/para is the least stable to complete the substitution mechanism because is harbors 2 cation centers next to each other, almost impossible to exist. Therefore, meta is the most important contribution. This is the basis for determining the directing effects of EAS reactions! Finally, a discussion on the reactivity of further substitution is necessary. EAS reactions are classified as activating when describing the effect on the EAS reaction of occurring multiple times on the same ring. For deactivating effects, the R group inhibits the possibility of further substitution. These considerations mainly follow the rules of Inductive Effects. 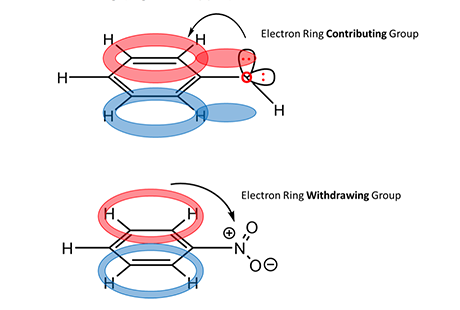 To understand this concept, think of the conjugated aromatic ring system and consider what happens when either an electron-rich or electron-poor atom is attached to the ring (Figure 4, upper). For a methoxy substituent, one lone pair of electrons on oxygen (electron rich) can add to the pi-orbital and contribute to resonance and stability of the conjugated system. Because the source of electrons for this reaction is the benzene ring itself, this property of the methoxy group increases available electron density and the likeliness for a second substitution reaction to generate a di-substituted product. However, for a nitro substituent (Figure 4, bottom), the nitrosium cation (electron poor) withdraws electrons from the conjugated system. This reduces the availability of electron density for the mechanism to work and reduces the likeliness for a second substitution reaction. 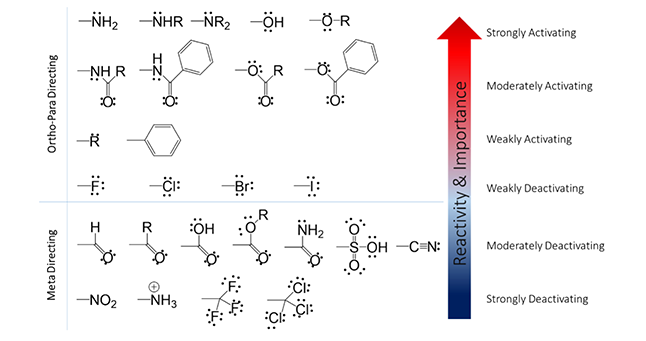 The activating/deactivating effects of substituents are indicated by the arrow in Figure 1. Remember, all of these considerations will affect the overall product identity and synthesis rate based on the starting reagent, but with a little logic and our helpful hints presented here, you are well on your way to acing the exam! This explanation on electrophilic aromatic substitution pairs extremely well with out flashcards on Aromatic Compounds. Check out what’s covered in our unique program and learn how it works. When you are ready to get started sign up here.